Even with its darker chapters, Star Trek is essentially about optimism and hope for humanity’s future. It’s a future where we’re free from interpersonal conflict, war, and disease (wars with aliens don’t count). When you look at Earth and humans in general—we’re all getting along in the franchise. We’ve evolved beyond petty disputes. However, that’s the series. In reality, when you have a franchise that is as longstanding as Trek is, there will still be problems along the way. That Star Trek is open-hearted and expectant, it makes a kind of horrible, ironic sense that the behind-the-scenes turmoil is as dark and ugly as it is. Star Trek fans are a passionate bunch, so you’ve probably heard some of the stories: cast member feuds, studio interference, executive stupidity, rumors about certain actors wearing toupees and girdles. There’s even that story about Jonathan Frakes refusing to shave his back hair in Star Trek: Nemesis, which is both funny and unfortunate. But then there’s the really heavy stuff. There are fifty years of Star Trek stories. Over a thousand episodes and a library of films. There’s bound to be trouble. These are 15 Dark Behind the Scenes Star Trek Stories. Over the years, many actors have made their dislike of their time on Star Trek well known. Robert Beltran hated playing Chakotay on Voyager. The series rarely paid his character any attention, it relied heavily on technobabble, and Chakotay himself was as wooden as a forest of pines. Diana Muldaur, who portrayed Dr. Katherine Pulaski on The Next Generation, hated her time on the series and left after a single season. Patrick Stewart, William Shatner, Leonard Nimoy, and DeForest Kelley have all tried at different times to escape their Star Trek legacies, but grew to appreciate and embrace their role in pop culture and what the characters mean to fans. And then there’s Jolene Blalock, aka T'Pol. She grew up watching Star Trek and loved the franchise. Unfortunately, she was on Enterprise—the show that makes Voyager look like The Original Series. Blalock, understandably, hated the series because of its lazy writing and wasted potential, even going on several rants, calling the series finale "appalling" (and it was!) while doing press for it. She didn’t endear herself to the studio, but her honesty made her beloved by fans. This is somewhat well-known, but worth going over again because of the skeev. Famously, Gates McFadden left Star Trek: The Next Generation in season 2 and reappeared the next year as though nothing happened. The reason she left was because of Executive Producer Maurice Hurley; namely, that Hurley was sexually harassing her, and, depending on the story, that he tried to get rough with her on set. The cast didn’t respond well to Hurley after that; Patrick Stewart actively worked to get McFadden back on the show while the cast pushed to get Hurley removed. Considering the negative feedback Gates’ replacement received, along with the complaints against Hurley—who also had the creative backbone of a jellyfish—TNG was essentially reset in season 3. Hurley was tossed and replaced with the lovely and talented Michael Piller and Gates McFadden returned. Jeri Ryan’s Seven of Nine joined Voyager midway through the series’ run. In order to free-up the money for a new cast member, one needed to be killed off (more on that later). Once Seven joined, the series refocused to develop her character. The fact that she was new and offered a unique voice to a homogenized cast made her a favorite of the writers. That unique voice (combined with her hotness, let's face it) made her a favorite among fans. Kate Mulgrew, not so much. She resented Jeri Ryan for taking the spotlight away from the established actors and was rude to her during filming, often walking off-stage whenever she was out of the shot, forcing Ryan to have a conversation with thin air. For their scenes together (of which there were many), Mulgrew would sometimes read a magazine and chime in whenever directed to. The two now are on friendly terms, but during the run of the series, it seems Ryan had as much fun making the show as the rest of us did watching it. Rick Berman is a polarizing figure in Star Trek. He oversaw the franchise following Gene Roddenberry's illness and eventual passing, and shepherded it through its most successful years, but he was also responsible for its decline. Berman was a micromanager who didn’t take many risks. Deep Space Nine was the epitome of risk (and, after all, risk is our business). It took place on a space station. It was serialized. It was dark. It was clearly something Gene would’ve had a problem with. Berman, according to producers and cast members, didn’t like the series. Under Michael Piller and Ira Steven Behr, the show was dark. It was mean. It was risky. Over the years, budgets were decreased, storylines were hampered, or altered, or outright refused. A push for a DS9 film (or at least a crossover) was shot down, burned, and its ashes spread over a bottomless pit. Berman often opposed the Dominion War arc, claiming it was too dark. Ira Behr allegedly responded, “Wars are f*****g dark!” Ira Steven Behr is a king among men. Star Trek is known for exploring difficult topics, but it's also known for fumbling the exploration. “Blood Fever” preached cultural relativism. “Dear Doctor” and “Pen Pals” featured main cast members preaching genocide. “Tattoo” portrayed Chakotay’s father as someone who supported racial purity—and took his side. Yeah, sometimes Trek made some bad calls, but at least they never advocated terrorism and—what? Oh, crap. Well, Star Trek once (accidentally) advocated terrorism in the TNG episode “The High Ground.” In an episode dealing with the complexities of terror, Data attempts to bring it home to the audience by coloring in some Earth history for context. Reminding us this is a sci-fi show, he references our past (and still future), by claiming Ireland was unified in 2024 after a massive terrorist attack. Unsurprisingly, British TV banned the episode before its debut in 1990, and never actually aired an unedited version until 2007. Gene Roddenberry wasn’t the best writer. He was, however, an amazing re-writer (yes, that makes sense) and had an amazing eye for world-building. He was a workaholic who created one of the greatest sci-fi journeys of all time (it’s much better than Star Wars—admit it, you know it to be true). However, Roddenberry also had his demons. This includes serial philandering. He constantly cheated on his first wife, Eileen Rexroat, with his next wife, Majel Barrett, while also carrying on another affair with Nichelle Nichols. Nichols herself ended the affair, allegedly saying that she wasn’t going to be “the other woman to the other woman.” While working in Hollywood, he used his power and authority to coax young, desperate starlets into sleeping with him to get roles on TV and film. So yeah, he wasn't the best person, either. DC Fontana is a famous name in Trek lore. She’s written classic episodes of The Original Series (“Friday’s Child,” "The Enterprise Incident"), script-doctored dozens more (including “City on the Edge of Forever"), contributed scripts and concepts to TNG, DS9 and dozens of other Star Trek related projects, to say nothing of her 50+ year writing career and works outside the series. Despite having worked as a writer on other shows beforehand, NBC was less than thrilled with having a female writer on Star Trek. Why exactly is unclear—either they felt she wouldn’t be taken seriously or they doubted her abilities. But Gene Roddenberry was a longtime friend, and he fought for her. In the end, she got the job, but had to use the pen-name DC Fontana because it would sound male, rather than her actual name, Dorothy, which she had been previously credited as on prior projects. Ironically enough, her work in Star Trek earned her such a following that DC was the name she began using in the majority of her work since. Star Trek is very well known for being made on a shoe-string budget. TOS purportedly cost $14 and a half-chewed candy bar per-episode. Some of the consoles on the bridge were Jolly Ranchers glued onto plastic; almost everything was paper mache. Scripts were written based on what props, sets and clothes were not currently being used. Gene Roddenberry once cast his own lawyer for a role. 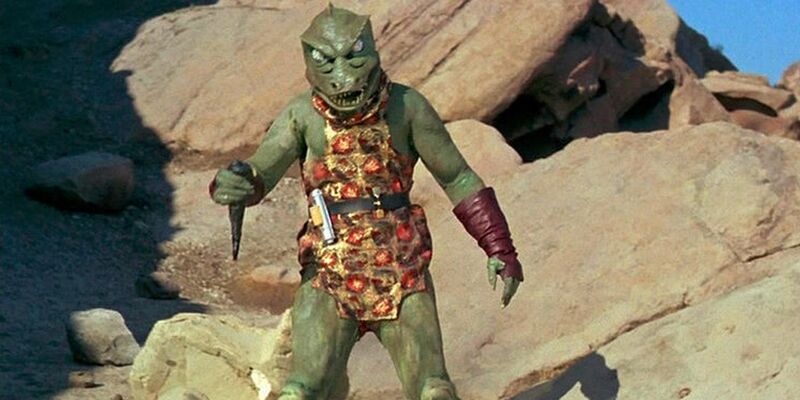 For god’s sake, you’ve seen the Gorn suit. Apparently, NBC didn’t want to pay seamstresses to make enough uniforms. In response, the producers had to get creative. Herb Solow and Robert Justman paid a non-union, overnight sweatshop cash to make the minimum number of uniforms needed and snuck them back on set through a back window. And just like that, a classic series was born. When the Voyager writers devised Seven of Nine, one established cast member had to go to free up the money. Rather than kill off the irritating, self-obsessed, and undoubtedly lice-ridden burden Neelix, they chose Kes. But that wasn’t the plan at first -- they wanted to kill off Harry Kim. Actor Garrett Wang was long frustrated over his lack of use in the series and was told to tone down his acting so the alien characters can seem more animated. In short, he had to play Harry as wooden as Chakotay. Wang didn't take this well. He started showing up to set intoxicated (though he still managed to do his job; that’s how little the character had to do). Regardless, this rankled producers, who were writing up his pink slip when Garrett Wang landed on People Magazine’s 50 Most Beautiful People in the World. Looking to capitalize on this, they kept Harry Kim alive and continued to do nothing with him. Ahh, Voyager. Like several others we've already mentioned, Nichelle Nichols’ Uhura didn’t have much to do in The Original Series. She mostly sat at her console and picked up communication waves. Sure, there was the odd karate chop she would level an extra with, but it didn’t add up to much. According to Nichols herself, she was considering leaving the show to explore meatier roles. That was until one night at a party where she encountered Martin Luther King, Jr., and his wife Coretta absolutely beamed (tee-hee) at seeing her. They were fans of Star Trek and said it was one of the few shows they actively encouraged their kids to watch. One of the main reasons was because it showed an African American in a positive light as well as a position of power. Nichols was heartened by this (how could you not be?) and decided to stay on. Star Trek had trouble creating realistic friendships. Both Spock and McCoy and Odo and Quark had great adversarial friendships, but a regular, normal friendship never developed quite right with other characters. Until Bashir and O’Brien on Deep Space Nine, that is. Bashir thought O’Brien was rude and O’Brien thought Bashir was smug, but over time, the two developed a friendship that was consistently quotable and surprisingly realistic. In reality, however, Alexander Siddig and Colm Meaney didn’t like each other. Siddig is an Englishman, Meaney is an Irishman. Even the writer of “The High Ground” could see that this was going to be a problem. Reportedly, they clashed politically and philosophically very often and were not particularly fond of the other. It is a testament to the talent and professionalism of both that their scenes together were as seamless as they were. To the surprise of no one, young William Shatner was difficult. It’s so well known that it’s practically its own meme. Hell, Shatner himself has admitted it. He’s a sweetheart these days, but in those early years, the crew of the Enterprise wouldn’t have minded a mutiny. James Doohan once said that he loved Captain Kirk but didn’t care much for Bill. George Takei’s distaste for Shatner has been well-documented to the point of obsession, and Nichelle Nichols has made some comments as well. Despite being longtime friends with Leonard Nimoy (a broken-hearted Shatner made a Nimoy documentary upon his friend’s passing), the two disliked each other passionately until the second year of the series due to Shatner’s prima donna attitude. Shatner was also close friends with DeForest Kelley, but admitted that they didn’t speak for almost two years after Shatner accidentally laughed when Kelley told him of the bizarre way his dog died. That said, considering Shatner’s reputation within the industry (and if his Twitter and philanthropic work is any example), his youthful attitude disappeared as time drew on. Unfortunately, the reputation was largely due to Roddenberry’s longstanding problem with drugs and alcohol that dogged him throughout much of his career. Grandly, he would take uppers to stay up and work and downers to get to sleep. This is a bad thing for someone’s health, and worse for Roddenberry, who was also diabetic. DC Fontana herself noted that his rotten reputation with co-workers and the studio stemmed from his drug-fueled paranoia. Fans loved Grace Lee Whitney’s Janice Rand from TOS, despite only appearing in a handful of episodes in the first season. Her disappearance was sudden, though excuses were given in-universe (transfer to another ship) and by the studio (they wanted to keep Kirk “married” to his ship). But Whitney recounts a very different story in her memoir, The Longest Trek: My Tour of the Galaxy, however. During her time on Star Trek and already struggling with drug and alcohol addiction, she was plied with booze and raped by a major studio executive. Leonard Nimoy and DeForest Kelley were important support systems for her afterward. A combination of fan support and studio apologies brought her back in the fold. Ten years after leaving, Whitney returned to make appearances through TOS films, episodic appearances, and fan productions for the next several decades. However, only Nimoy and the studio knew the details of her assault until the release of her memoir in 1998. The executive has gone unnamed even after all these years.